As originally published in Mt. Pleasant Magazine, 7/2015. Special thanks to my editor, @DeniseKJames. Original photo by Heather Grilliot, additional photos courtesy author. Maniacal and seemingly half-crazed, Glenn Roberts bursts through the back kitchen door. He turns to leave, then spins back, quiet for a moment. And like that, he’s gone. Nostrale translates roughly to “our rice,” and the prevailing thought is that it may be the great grand-daddy of Vialone Nano, perhaps the greatest of Italian risotto rices. The mere fact that I’m left holding a bag of $30,000 rice is astounding enough but pales compared to its potential. A victim of my own insatiable curiosity, I look into the efforts of the Carolina Gold Rice Foundation. So on a Friday afternoon, between morning private dining functions and a full book for supper service, I find myself making that same hectic crosstown trip for the CGRF meeting. Surrounded by doctors, intellectuals and agricultural specialists, I’m so in over my head it’s not even funny. I learn how farmer scientists are pursuing a study of agricultural anthropology to discover whatever became of that 1748 Nostrale rice. Along the way, there’s discussion about bee colony collapse disorder, Antebellum plantation infrastructure, repatriation of the fabled Purple Ribbon sugar cane variety on Sapelo Island and the restoration of Lowcountry indigo, a mainstay in 18th century textiles. 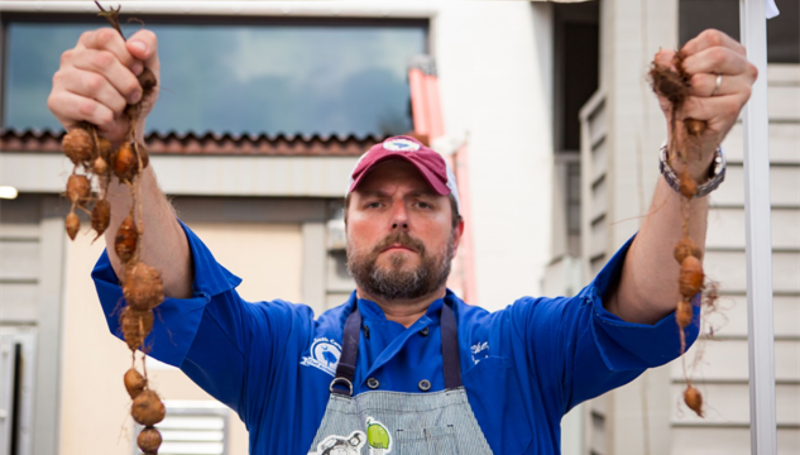 Highlighting the traditions of our shared South Carolina history, Brian and his team are at the vanguard of research and restoration of these lost flavors. He shows me three types of farro growing, a variety of wheat unseen since the 19th century, and a grafting operation to save watermelons from disease. “I can grow most any seed you give me,” he states, pointing out that he’s most proud of his peanuts. As the story goes, in 2012, Dr. David Shields of the University of South Carolina was able to track down the sole remaining seed samples of the Carolina African runner peanut, widely considered to be extinct. He was given about 20 seeds, roughly half of what was left in existence. The seeds went to Ward, who is now at the tail end of a project to grow them out. with them in your own kitchen,” he says. Dr. Brian Ward grinding Jimmy Red corn by hand. Nat Bradford’s in the process of moving his family back to the family’s ancestral seat of Sumter, South Carolina, when he stops by to see me on a clear May morning. His Bradford watermelon seeds are due to go into the ground next week, but he’s made a special trip to Charleston just to hand me some mason jars. You might have heard the story of how Nat’s great great-great-grandfather crossed the legendary Lawson watermelon with the Mountain Sweet watermelon in the 1840s. By the time of the Late Unpleasantness, the Bradford was the preferred watermelon of the South, so much so that growers routinely poisoned or, later, electrified their melons to discourage theft. With the advent of truck farming in the early 20th century, the Bradford became a dinosaur. Unwieldy at a 30 pound average, and prone to bursting due to its high water content, the Bradford didn’t meet with modern industrial standards and was last commercially harvested in 1922. But learning that his family’s namesake was thought extinguished, Nat emailed Shields, whose own search for the seed had been fruitless. And so began the effort to repatriate the Bradford. Nat grows out the melons to provide clean water sources in the third world. He works tirelessly to find alternate uses for his family’s melon. He reduces the juice down to watermelon molasses, a popular alternate sweetener in the 19th century. He pickles the inch-thick alabaster rind with a concentrated agro dolce spice and a long finish redolent of fresh watermelon. His pickle and molasses are both otherworldly, but I don’t want to embarrass him. Between you and I, I’ll say this: You’ll never taste a better watermelon. Cuisine, it is said, is driven by 80 percent ingredients and 20 percent technique. As a father, husband and chef, what I find more often that not is that if the story is compelling, we tend to sit up and really notice the flavors. In these and many similar instances, it’s not that the story ever went away – we’re just learning to be better listeners. These days, it all feels like a dream. My restaurant is not a temple of high gastronomy – it’s a simple neighborhood restaurant doing some good things. Maybe that’s the point. If this seemingly esoteric research results in a tasty supper here, perhaps it’s just a matter of time. What’s next? A return to Georgetown caviar, hearts of Palmetto, native chestnut and local heirloom sugarcane? It is indeed a great day in South Carolina and a fantastic time to be a chef. The outlook is tasty. Previous PostPrevious How Huguenot is your Torte?